Wild Adventures Theme Park in Valdosta, Georgia has announced a major construction project for 2019 with a brand new kids’ area featuring immersive wildlife experiences and a free admissions program for young children. The new area will feature six rides and several opportunities to get up close and personal with South Georgia’s most intriguing native species. The new additions represent one of the largest projects in the last decade, with a renovation of more than 3 acres. American Alligators are at the heart of the new kids’ area, which will be constructed near the main entrance to the park. The experience begins with Alligator Alley, a new exhibit that will be home to dozens of alligators. Families will learn about these fascinating creatures during daily zookeeper talks and the all new “Gators!” show. Alligator Alley will also offer the unique opportunity to feed an alligator, an exhilarating experience that connects guests with a powerful force of nature. The adventurous can get even closer with a stroll across Gator Crossing Rope Bridge, a netted bridge suspended directly over the alligator habitat at Alligator Alley. Okefenokee Express— This delightful train is the best way for junior travelers to navigate murky waters of the swampy South. Flying Gators— Step inside and go for a ride with the spinniest and dizziest gators in the swamp. Turtle Twist— Go ‘round and ‘round and up and down with these friendly and fast turtles. Swampwater Snake— Slither and slide on this family coaster as a silly snake takes families on a fun and slippery ride. Hoppin’ Gator— Little ones can hop, hop, hop to the top with these fun little gator friends. Okefenokee Friends— Some friendly creatures from the rest of the animal kingdom have come to the swamp to take you for a spin! 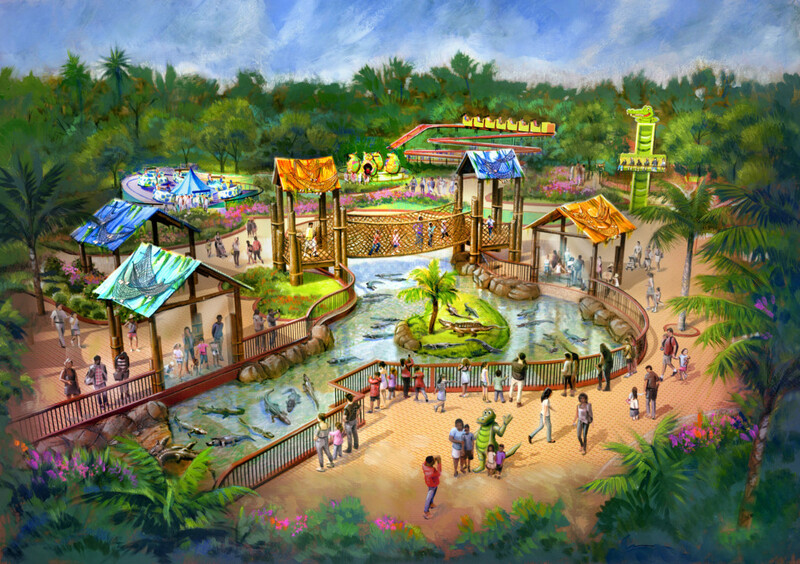 The new kids’ area will lead into the Alapaha Trail, which offers an authentic swamp experience as guests stroll through an actual Georgia swamp, encountering animal exhibits featuring native and exotic species. The Alapaha Trail finishes with a visit to Wild Adventures largest and most famous alligator, Twister. Construction off the new area begins October 1, 2018 and will open in March 2019. In preparation for the new area, Wild Adventures is making it even easier for families with young children to visit by introducing a new admissions program that offers free season passes to all children ages 3 to 5-years-old. Beginning September 17, parents of 3 to 5-year-olds will be able to register their children for a Pre-K Free Kids’ Season Pass online at WildAdventures.com/Pre-K. The free pass can be used for visits for the rest of 2018 and all of the 2019 season. “The Pre-K Free Kids’ Season Pass is another way Wild Adventures provides an incredible value for families,” said Patrick Pearson, marketing director. While Wild Adventures looks forward to new additions in 2019, the park is celebrating Halloween with Terror in the Wild and Kid-O-Ween beginning Sept. 21 and Wild Adventures Christmas select days throughout December. For more information about special events and operating days, visit WildAdventures.com.